Sears Garage Door experts can complete installation, repair, and replacement when needed. When you want a quality garage door replacement, local Sears Garage Door professionals have a number of excellent door options for home-owners. These experts are also trained to install the door that you select. We have some of the best warranties and financing around, don't forget to ask us about them. Give us a call at (972) 212-4025. Are you looking to have a new garage door designed and installed? Your local Sears trained and insured technicians can do the job for you. You can be confident that your new garage door will be installed correctly. When a replacement garage door is needed, Sears's professionals give home-owners a wide choice of high quality choices. Home-owners will improve their home's curb appeal with an insulated and attractive Sears garage door. Garage doors commonly suffer broken springs after years' of use. Local Sears Garage Door repair experts will have home-owners' doors working efficiently again. Home-owners who need their garage door opener replaced or repaired turn to their local Sears Garage professionals. With high quality replacements available, Sears technicians solve your opener problems with replacements and repairs. 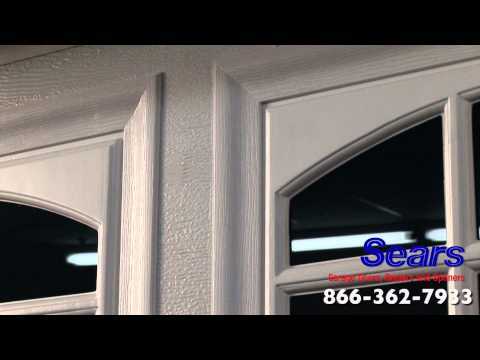 Sears Garage Doors is located in the Dallas area. Check out upcoming Dallas events. Hope to see you out in the community! Leave us a review on Google and receive 10% off next service! Come check out your Sears Dallas Garage Doors and Garage Door Repair crew on Facebook! Garage Door Replacement can be a stressful task. That is why you should lean on the professionals at Sears Dallas Garage Doors to replace your garage door in a safe and timely manner. Call 972-212-4025 to speak with a Garage Door Replacement specialist today. 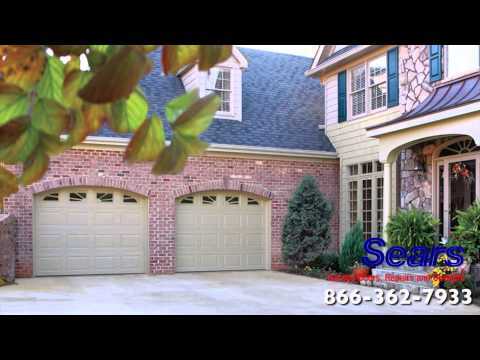 Sears Garage Solutions has several beautiful garage doors to choose from. Look through our selection of garage doors online and find the door that best fits your homes architectural design with our door designer. Sears garage doors are solid with steel construction. Choose from one of our energy efficient, insulated doors for the best interior look and energy savings. A new durable Sears garage door can improve the value of your home and give your home more appeal. Garage Doors can be a costly investment but one that will improve the value of your home. Call 972-212-4025 to speak with a Garage Door Replacement specialist today. All of our garage doors are made in the USA and pre-painted with 6 coats of paint including a rust preventative, primer, and top coat. Choose from a variety of colors and styles and find the best garage door for your home. Add natural light and beauty to your homes design with Sears Garage Door window options. Sears garage doors offers not only the best in warranties and durability, we also have a fabulous custom options such as color, styles, and window options. Visit our design center to find the garage door and options that fit your home and family. Justin was very professional and explained each features to the fullest! Thanks Justin. Justin was fantastic in service and explaining the features of our beautiful garage door with an awesome door opener!. Justin, you rock. Again thanks for a spectacular job. The Martin's. I'm very happy about the service the technician provided. Very professional, knowledgeable and friendly. The technician was extremely professional and thorough. Thank you. Technician called 15 minutes before arriving and he was ahead of schedule. Technician was knowledgeable and courteous. I have been calling Sears for ALL me appliance needs because the products are exceptional and the service is consistently professional. The technician was very nice, right on time and explained everything perfectly on what needed to be done. Todd was great. Knowledgable and efficient. No improvements necessary. Very pleased with the service provided. The installer did a great job. I have used them before and they are very professional and easy to work with. Very accommodating to the customer. i just wished i would have been called ahead before tech. got to the property. The was a return visit after the initial installation. This technician did complete the job satisfactorily. Very professional and gave me good information about maintaining the door- I would recommend your service to others. Josh was great through the sales process and did a great job with the install. They did a great job. They were very nice and professional.